The goal of the training series is to introduce the participants to the R software in analyzing data collected across space and time from a wide variety of industries. Moreover, the basic underlying assumptions of each model will be discussed so that practitioners know when to use the statistical model in ensuring the validity of the analysis. A practical approach using examples from different fields will be applied in teaching the interpretation of models and presentation of results in various contexts. Before delving into the analysis, the practitioner must be able to transform the data to a structure required by a statistical model. The "Practical Techniques in Data Management" is an introductory course to practical techniques in data management in using R, such as importing and exporting data, variable transformation, subsetting, summarization, data cleaning, and reshaping. Examples will be provided in discussing common data structures in the fields of market research, economics, finance, and other areas. The seminar on "Location Analytics Using Spatial Statistics' emphasizes the importance of spatial information in the context of decision making. Examples will include the use of market research data, demographic studies, real property analysis, and customer behavior. 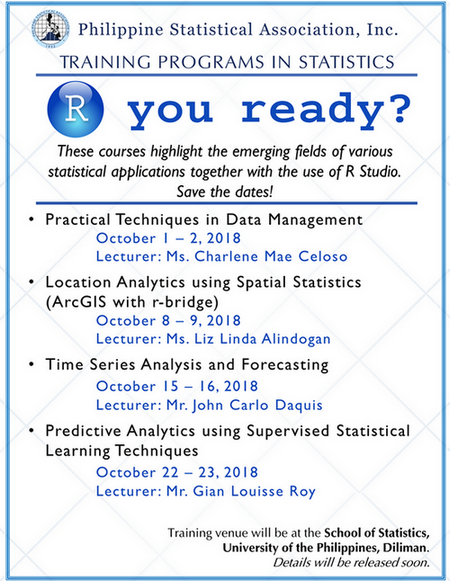 It is an introductory course on spatial data visualization, spatial associations or correlations, and basic spatial regression models, using R software and ArcGIS integration. The seminar on "Time Series Analysis and Forecasting" provides participants with a working knowledge of the fundamental principles and statistical techniques in time series analysis. The training will include the preliminary tests to detect the presence of trend and seasonality. Cyclical patterns will be extracted and analyzed using statistical models. Forecasting applications will be on economic planning, sales forecasting, supply chain planning, project monitoring, and financial analysis.